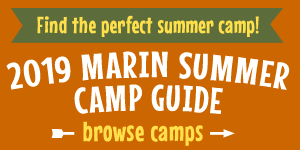 Spring will officially be here this week, which means plenty of family fun can be found in Marin and the North Bay. Here are our picks for fun events and outings for families with toddlers and preschoolers, like Slide Ranch's annual Spring Fling (pictured). Meet farm animals, have tea with Alice and the Mad Hatter, get messy with art, and more! Many of these events require RSVPs, so follow the links for more details and contact information. Explore, climb and touch trucks of all shapes and sizes at Touch-A-Truck, Presidio Civil War Lawn, San Francisco, Saturday, April 6, 10:30 am–3 pm. Explore nature at Slide Ranch's Spring Fling, Saturday, April 27, 10 am–4 pm.